Eligible candidates can attend Airmen Recruitment Rally at at Air Force Station Rajasansi, Amritsar, Punjab from 05.05.2017 to 09.05.2017. Candidates required to register themselves from 6 AM to 10 AM on same date of rally. Candidates must carry Pencil, Eraser, Sharpener, Gum, Stapler, Blue/ Black pen, 7 recent passport size photographs, 4 sets of attested photocopies and original SSC, Intermediate memorandums, Residence proof, NCC Certificate, Consent from etc. along with them. 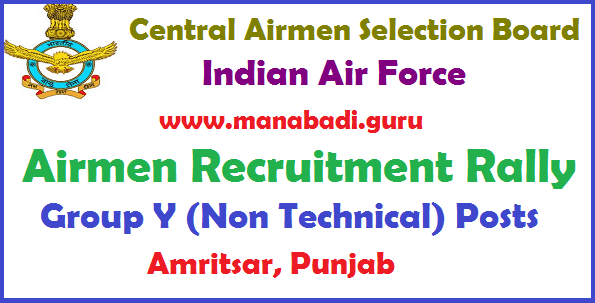 #All Eligible and Interested candidates can attend Airmen Recruitment Rally at Amritsar from 05.05.2017 to 09.05.2017.